This hotel is very close to the airport which is great for early flights. The staff is friendly. There is a restaurant next door that serves delicious food. Where to find Boutigny-sur-Essonne hotels near an airport? Where can I find hotels in Boutigny-sur-Essonne that are near tourist attractions? For those travelers planning a trip to Essonne and want to book a comfortable hotel or apartment in Boutigny-sur-Essonne, there are several places to choose from. The middle of Boutigny-sur-Essonne has 3 Expedia-listed hotels and apartments within 0.1 kilometres (0.06 miles). 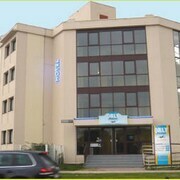 Hotel options that aren't far from the city center of Boutigny-sur-Essonne include the Hôtel La Belle Etape and La Raimbaudière. You could check out the Hôtel & Spa les Pléiades and the Hôtellerie du Bas-Bréau. 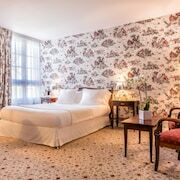 The Hôtel & Spa les Pléiades is positioned 16 kilometres (10 miles) away from the main part of Boutigny-sur-Essonne. The Hôtellerie du Bas-Bréau, is situated 16 kilometres (10 miles) away. 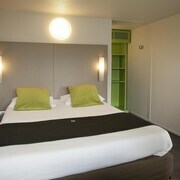 Some other accommodation options are the Château Augerville and the Mercure Paris Sud Les Ulis. Looking for more to do? Spend a few hours discovering Vilgenis Castel and Georges Brassens Park, in Massy, 35 kilometres (21 miles) to the north of Boutigny-sur-Essonne. 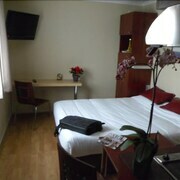 Expedia-listed Massy hotels are the Mercure Paris Massy Gare TGV and Residhome Appart Hotel Paris-Massy. 20 kilometres (13 miles) to the northeast of Boutigny-sur-Essonne, is Saint-Pierre-du-Perray, home to the Clarion Suites Senart Paris Sud & Spa and Hôtel Novotel Senart Golf de Greenparc. The Greenparc Golf Club and Parc Babyland are a couple of the more popular attractions to check out while in Saint-Pierre-du-Perray. If you like sports and really like games you might choose to head to Stade de France, which is 55 kilometres (34 miles) to the north of Boutigny-sur-Essonne. For visitors who are keen on staying close by, make a reservation in the Hotel Particulier Montmartre or Hotel Design Secret de Paris. For those travelers planning on arriving via Orly Airport, you may find it convenient to book some accommodation at Mercure Paris Orly Rungis, or Hilton Paris Orly Airport, which are both a short drive away. What are the most popular Boutigny-sur-Essonne hotels? Are there hotels in other cities near Boutigny-sur-Essonne? 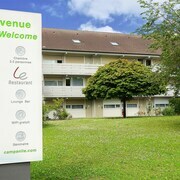 What other types of accommodations are available in Boutigny-sur-Essonne? Explore Boutigny-sur-Essonne with Expedia.ca’s Travel Guides to find the best flights, cars, holiday packages and more!